These are exciting times! 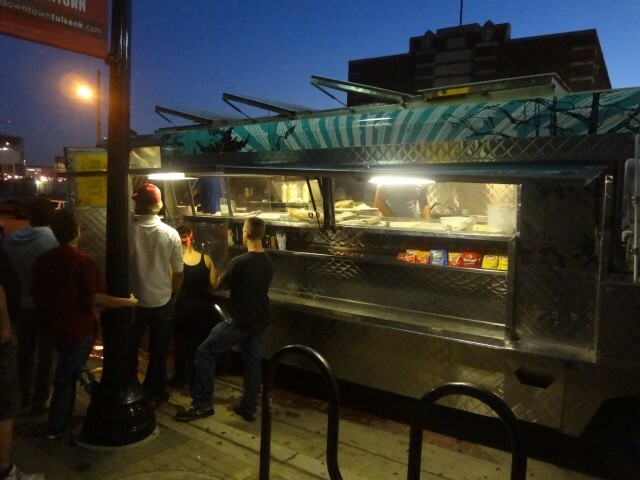 Over a month ago, I wrote an article about how we need more food trucks. All of a sudden, BAM! 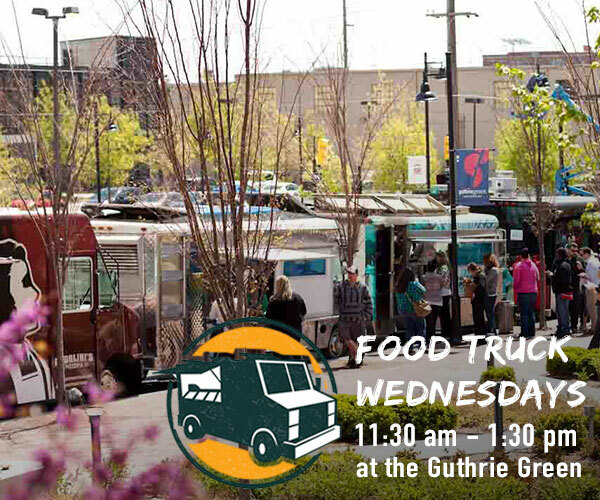 More food trucks have started appearing. This is so great! I’m so excited. And it’s all in good timing because Tulsa is having their very first Tulsa Food Truck Festival on September 29th, from 11a-8p, and the 30th, from 12p-4p! Of course, I have to go around and sample all this stuff for you first, so you can get an overview of what exactly is going to be there. Darn my luck. But somebody has to do it. 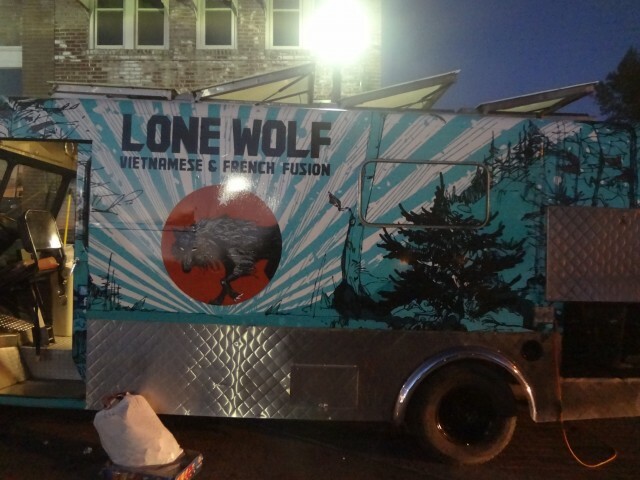 I received email saying this new Lone Wolf food truck was going to be opening downtown. 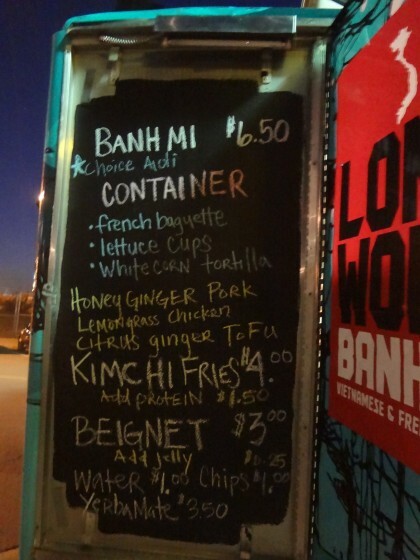 Vietnamese bahn mi, kimchi fries, beignets, etc. I just had to check it! 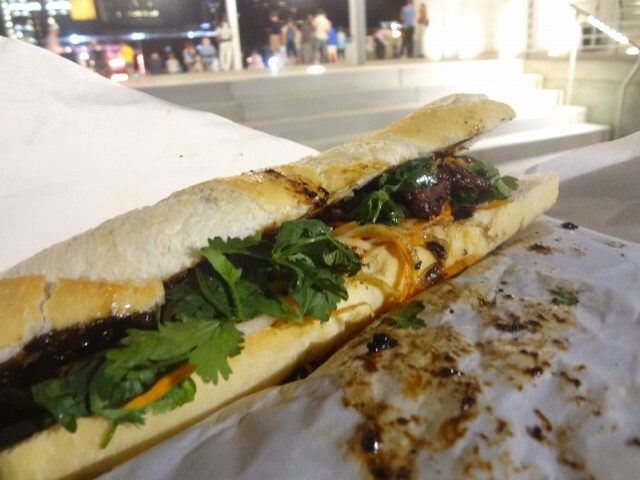 I love bahn mi! They were parked by the Soundpony, just a building down from Cains ballroom. And the line was long already! I quickly ran up, looked at the menu, and got my place in line. The order of operations was nice; girl with an iPad taking orders and credit cards and two guys in the truck cooking up a storm. Everything was going smoothly. Until the shout, “Only one more order of kimchi fries!”. And the guy in front of me ordered the last order of kimchi fries. No! That was supposed to be mine! This vile and foul man in front of me. The evil! He took my fries! Such a heinous act. I was upset. I almost threw him out of line. The owner of the truck told me they went through 50lbs of fries already. Dang. It was only 8:30pm. I calmed and collected my broken pieces. At least they still had bahn mi and beignets. Power outage? You have got to be kidding me. Right as I order, the power goes out. I’m in serious arrest here! It was probably that guy that ordered the last kimchi fries. He felt my disdain towards him. I know it. But, after about 6.37 minutes of scrambling around trying to fix the problem, the power came back. A minor setback and they were back in biz. I ordered the pork bahn mi and the beignets. 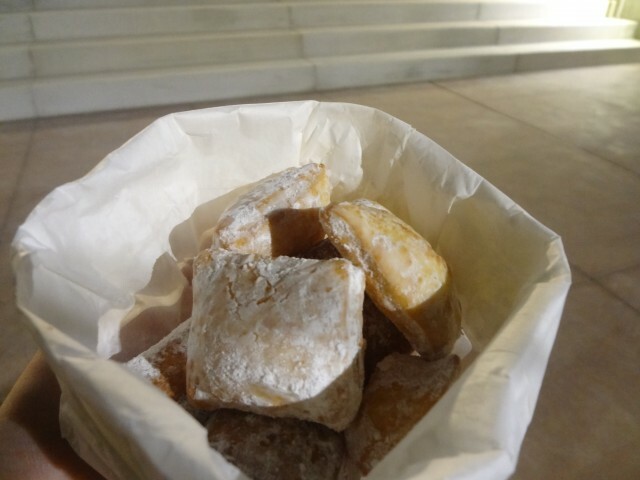 To my surprise I was the first to order the beignets. 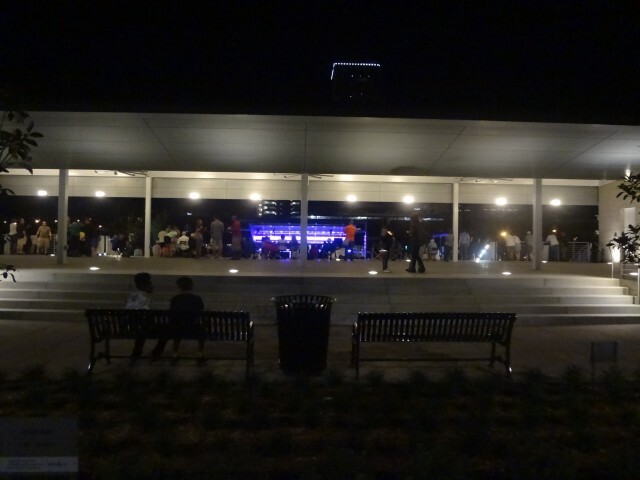 My food was done in a timely fashion, I said my goodbyes, and we walked a block over to the new, and conveniently opening weekend of, Guthrie Green to listen to the live bands and to let the kid have some fun. Downtown is the place to be. I unwrapped my bahn mi and bit into the deliciously filled baguette. It was bliss, I tell you. The flavors were a melding of excellence. Cilantro, pickled carrot, honey ginger pork, with a garlic aioli. The produce was fresh. The bread was fresh as well. The pork was packed with flavors. Racy and bright. Topped off with the those delectable, little, puff pastries we know as beignets, and our night was set. First night woes happen. Hence, the soft opening. Trial and error. Fix. Do better. That’s the way it goes. The sandwich and the pastries were worth the extra time lapse. I was informed the baguettes were done, or going to be done, by a local baker. And the produce might be locally sourced as well. Sorry, long line, fast night, I wasn’t able to extract all the nitty gritty details. And soon they’ll have a facebook and twitter and all that other stuff for us to follow and know their locations. For now, they’ll most likely be open on the weekend evenings in the 18th and Boston area. And they are planning to be at the Tulsa Food Truck Festival as well. These are exciting times! I’m a home cook with a little professional dabbling experience. A lover of craft beer! And if you don’t know about craft beer, then you will. Effervescent, vivacious, flavorful, and extremely wonderful. Happiness in a bottle….or can. Craft beer is an amazingly diverse and complex drink. Around one hundred different styles of beer in the world and thousands of breweries. A booming industry right now in America! And still, craft beer is deserving of MUCH greater culinary respect than it has been receiving. I believe there is a beer for everyone and a beer for every delectable dish out there. I believe it stands up to wine just as well and even better in the culinary world. Cooking, pairing, drinking, and education. I hope to bring some useful knowledge into the foodie world concerning great beer with great food. Not everything is about beer, but it sure does make it better. Cheers!